The Alumni Are Coming! The Alumni Are Coming! Potential employers, mentors, contacts WILL look you up there. You can learn a lot about the successful career paths of other people with skills and interests like yours. It’s a great way to connect with alumni. Make sure to include a professionally appropriate photo (doesn’t have to be a formal headshot, but it should depict a version of yourself that’s suitable for the workplace). Using the same photo on all the social media platforms you use can make networking easier. Give yourself a compelling headline and description. “Sophomore at the University of Illinois” can get you started, but think about ways to “headline” the particular skills you’re developing and the kind of work you want to position yourself for. Move carefully past screens and pop-ups that invite you to “connect” by linking to your email or other social media accounts. You can cultivate your network more effectively (and irritate fewer random acquaintances) by waiting until you have your account set up and then “Connecting” directly with relevant individuals through LinkedIn. Create a shorter and identifiable version of your LinkedIn public profile URL and add it to your signature line on the email account you use for professional purposes. Don’t get LinkedIn Premium–the free version will get you everything you need. 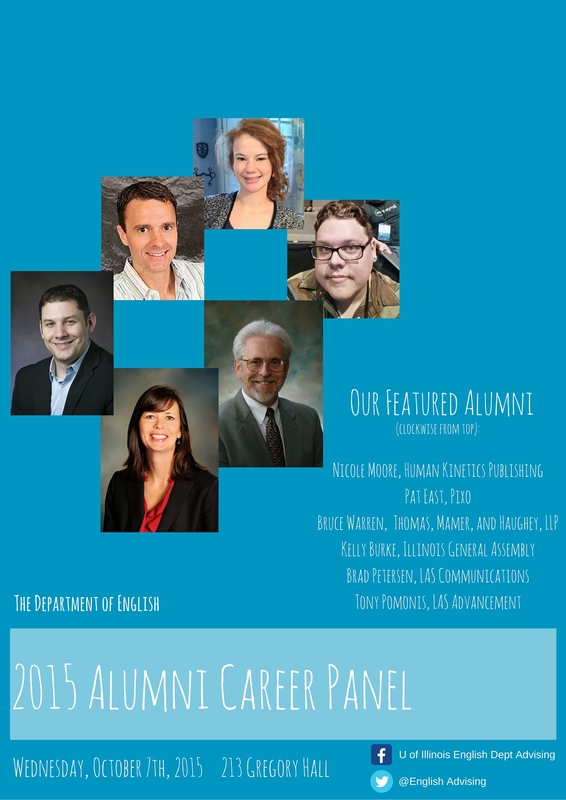 The Department of English Alumni Career Panel will take place on October 7, from 5pm to 6:30pm in 213 Gregory Hall. Come! Six English department alumni will describe their work and the paths from their English department BAs to successful careers. September 30, 2015: The Graduate and Professional School Fair. October 6, 2015: The Law School Fair. February 5, 2016: the Arts Administration Career Fair will take place in Chicago, hosted by UIC and the University of Illinois at Urbana-Champaign College of Fine and Applied Arts, College of Media, and Department of English. Learn about jobs and internships with Chicago area organizations involved in the creative arts. March 9, 2016: The Illini Career and Internship Fair, which used to be known as the All-Campus Career Fair, brings a wide range of employers to Champaign-Urbana to recruit students from all over campus for jobs and internships. Lit/Writing Nerds :: Pygmalion TECH??? Yes! Make no mistake, print is far from dead. a lot of communicating (what we used to call “writing”) now takes place online, on platforms and in media that are continuously changing. The savvy English or creative-writing graduate is answering ads for social media management or search engine optimization, job categories that barely existed 10 years ago; and the job those majors will do five years from now probably don’t yet have names. You should get to know this world and the purposes for which it needs you. Pygmalion TECH offers some excellent opportunities to do just that this weekend. You can find the full line-up on their schedule (and of course, you should check out the excellent MUSIC and LIT offerings we well)! The “Internet of Things” is…a thing. Find out what it means at this session. Interested in the conflict between editorial control and advertising in media? Hear from the guy who gave up his executive editor position at Gawker.com rather than let advertisers call the shots. The future of immersive tech, whatever it may be, will require words. See the creative side of tech at the Thursday TECH Crawl in downtown Urbana, 4pm – 6pm. Not convinced anyone wants you there? The Pygmalion TECH festival pass is FREE to students with ID.